Microsoft has scheduled its next event, and instead of focusing on the company's inability to count, this one will be all about the cloud. "Join us to hear what's ahead for Microsoft's Cloud," reads an invitation with the date October 20. 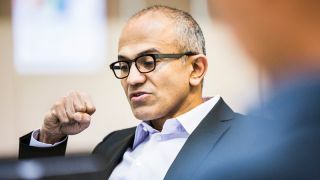 Microsoft CEO Satya Nadella and Executive Vice President of Cloud & Enterprise Scott Guthrie will both speak about the cloud during the one-hour event, says ZDNet. Luckily the press conference will reportedly be broadcast live, unlike the Windows 10 event, hopefully indicating that it will have a slightly more consumer-friendly focus than the enterprise-heavy W10 reveal. Nadella is still relatively fresh in the CEO seat over at Microsoft, and he said over the summer that Microsoft will henceforth focus on the Internet of Things, mobility, and the cloud. Windows 10 is a good start to delivering on that promise. The company's October 20 event will reportedly feature both a recap of Microsoft's cloud investments and a spiel about how Microsoft's cloud services trump its competitors' options, according to ZDNet's sources. Hopefully there's something interesting in there as well.